Most of the U.S. is celebrating the arrival of Fall, but we're still in the triple digits here, so it's hard for me to think of Summer as done and gone. I'm still staying indoors during the day, and drinking cooler-type drinks in the afternoons. So, even though it may be a bit late for some, my Choco Friday offering this week is a salute to summer with a gathering of Chocolate Cooler recipes. 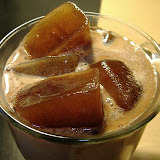 First up, a bump to my own Espresso-Ice Cocoaccino recipe. Espresso ice is nice. In creamy cocoa, even better. Spoon coffee ice cream into blender. Add rum and finely ground coffee. Blend on high until creamy smooth. Pour into tall glasses, adding a scoop of the vanilla ice cream to each glass. Top with whipped cream if you like. Sprinkle chocolate shavings over the top. Place hot water in a medium-sized pitcher. Stir in coffee. finely ground into a powder texture, until dissolved. Stir in milk. Place 1 scoop or ice cream in each of 4 ice cream soda glasses. Pour coffee/milk mixture equally into each glass. Fill glasses almost to brim with club soda. Top with sweetened whipping cream or prepared whipped topping. Serves 4. OY that sounds good. Got chocoverload? Wait, I'm not done yet! Chocolate Fudge Shake from DrinksMixer.com. Non-alcoholic, but still, could be deadly. It uses fudge brownies. !! Alright, I guess that's enough to keep ME cool at least through the end of October, and by then it'll be time to start the yummy hot drinks. OK, so it is not still hot here in WA, but we do need to build up our 'fat reserves' to get us through the winter. I know these drinks will do the job.